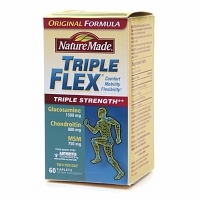 Triple Flex is a joint supplement from Nature Made. Triple Flex has all the ingredients that joint supplements have been using for years. It has 1500mg of glucosamine, 800mg of chondroitin sulfate, and 750 mg of MSM. Nature Made has titanium dioxide coloring. Chondroitin Sulfate Has 800mg of chondroitin sulfate, an average amount. Chondroitin makes up glycosaminoglycans which are a component of cartilage. Methylsulfonylmethane (MSM) Has 750mg MSM, an average amount. MSM is a vital source of sulfur for protein and connective tissue synthesis. Glyceryl Behenate, Polyethylene Glycol, Triethyl Citrate, Polysorbate 80, Sodium Citrate. Hi, I am suffering from hip osteoarthitis. I am 38 years have 2 children and the pain in unbearable. I cant move. I will soon be moving to europe (greece) and I dont have any idea what products they have there. So far I am taking glucosamine(powder) 1,500mg. That’s it. I ve heard about the Hyaloronic acid and am about to order the “synthovia 7”. In addition i want to get the triple flex by nature’s made. A simple google search led me to this webside and now i would like to know what is the best supplement for my condition. ( i do not want to undergo any surgery yet). Do you recommend anything? I went from no ability to play softball or basketball,ride a bike,back pack or ski while feeling constant knee pain to doing all of them with no pain after a single injection of 1.2% Hyaluronic acid jelly (euflexxa) into the knee 18 months ago ! I would do it again for sure but the knees are still strong with no problems. Titanium dioxide is not a dye, it is a natural (now usually man-grown) mineral. It is a common ingredient in toothpaste, and is used to make paper white. You handle it every day. It is NOT a cancer agent. This leads me to doubt all the “unbiased” reviews on this site. Please use TripleFlex. I will make a big difference in your pain condition. I have been telling every that I know about TripleFlex.